Relationship between driver and spotter crucial to race team's success. OXFORD — More than 15 years ago, Glen Luce’s Oxford 250 was over before it began. There are a set of eyes to get drivers through the chaos. Qualifying, pit strategy, tire management are all keys to winning the Oxford 250. A good car, a talented driver and a crew chief who knows what he’s doing are all part of the recipe. So, too, is a good spotter. No one can win the Oxford 250 without one. Most weekend’s, the spotter’s job on a race team is a straightforward one. The spotter watches the races and, via radio communication, relays important information to the driver. He lets a driver know where other cars are relative to his own, gives lap time information and might offer advice about where other cars are finding more success on the race track. At the Oxford 250, everything changes. It’s no longer a typical race day. With more than 70 cars expected for Sunday’s race, practice sessions are chaotic, with more than 30 cars on the track at one time — entering and exiting without warning — all traveling at different speeds. During heat races, the intensity is ramped up as drivers try to secure just one of four available qualifying spots. And during the 250-lap main event itself, there’s a crowded pit road to get on and off off with out incident and cars on varying pit strategies. 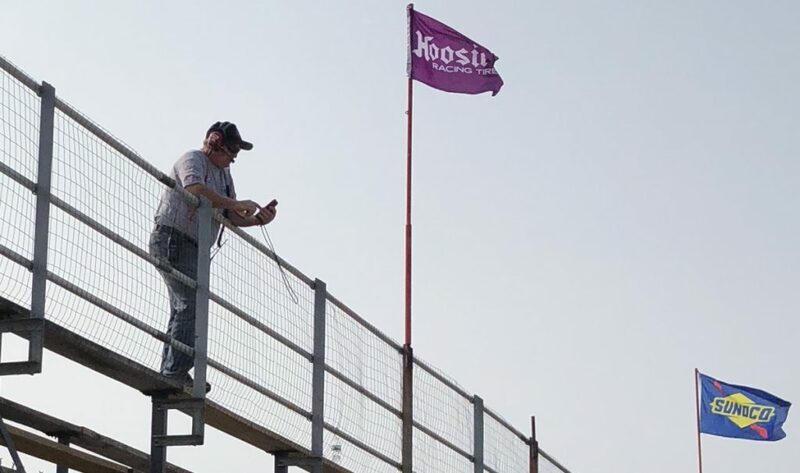 It’s a lot to keep track of, which is why a driver needs a set of eyes at the top of the grandstand, somebody who can see everything he can’t going on around him. Alden, of Leeds, was sitting in the spotters stand when Luce won the 2015 Oxford 250. A former racer himself, Alden has been working as a spotter for 12 years. He got started with Tommy Ricker in Oxford’s weekly Late Model division before moving over and working with Austin Theriault. When Theriault’s career took off and the Fort Kent native moved south, Alden moved over to work with Luce’s team. Rowe has worked with Tapley since 2011. He can’t imagine another spotter in his ear. Tapley, of Deering, New Hampshire, understands the difference between a typical Pro All Stars Series race with 25 cars and the Oxford 250 with it’s 70-car field. Qualifying can be tense, but he doesn’t think there’s any added stress on the spotters. Alden, though, remembers the time Theriault didn’t make the Oxford 250 in 2010. He wore part of the blame on his shoulders.